Caption slip reads: "Photographer: Wesselmann. Date: 1957-02-06. Reporter: Decker. Assignment: Dutch refugees arrive in LA. 1: One of the Dutch families that arrived in L.A. this a.m. via Sante Fe's El Capitan: L to R: The DeKrieger family, Sebus (mother), Janna, Albertus and Jacoba and Hendrick, husband and father. 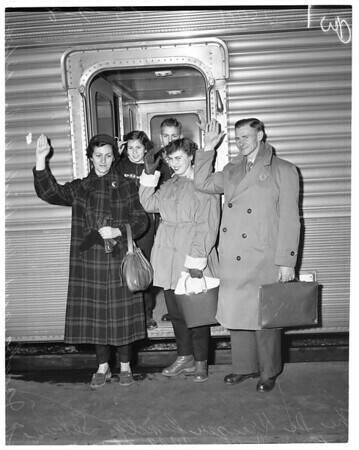 2: General view of part of the 80 persons who arrived on the same train".